We give you 6 hours, coffee and an introduction with the space you don't know. A tiny residency to inform/complicate/transform your creative work and the way we view space in NYC. 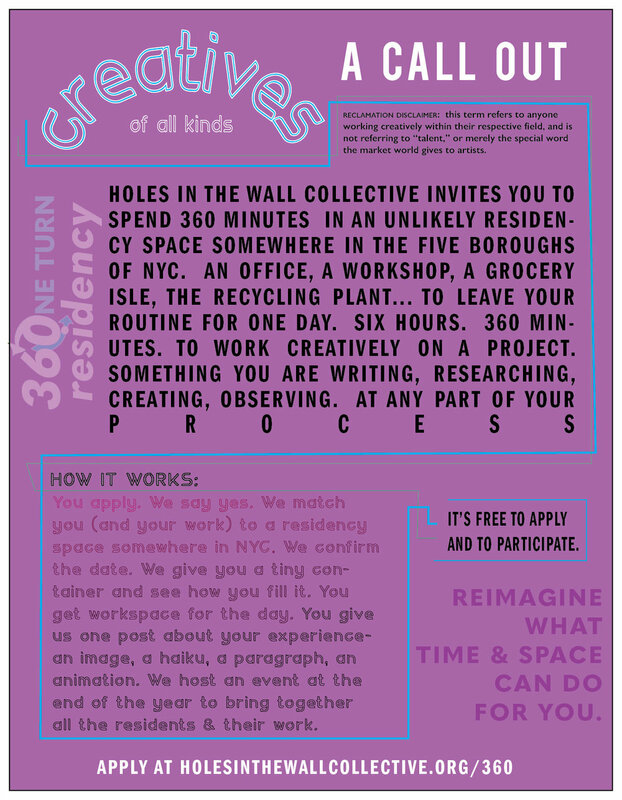 Holes in the Wall Collective invites you to apply for a extra-mini creative residency in one of the five boroughs of New York. TO RETHINK WHAT A RESIDENCY LOOKS LIKE. For both the resident and the space. You tell us what you are working on and we’ll pair you with a space in New York. We meet you at the space, introduce you to your residency space for the day and you take it from there. You’ll have 360 minutes. We’ll ask you to make one post during your residency about something that came up in your work or your interaction with the space. It gets put online as part of a series. We’ll host a public event this fall and invite all participants to attend and share their work. It’s free to apply and participate. Residencies held on select Saturdays & Wednesdays starting in May. Can be process or product oriented. If you are unsure for now, just let us know. For a 6 hour window between 9a-6p. If so, tell us what kind of mess– we want to make sure we place you where your kind of mess is welcome. We encourage you to think on this– some spaces, depending on your activity could welcome public curiosity. This could support or hinder your process. You might think you would like this and hate it, or visa versa. You may not know until you're in it. Give us a sense in your response of how your thinking you would or would not like to engage. Any links you want to show us or other related work/writing. Any thing else you want to say about your work/process etc ?